Can a heated floor be soundproofed? Does a heating floor system can be soundproofed? People who have installed a heating floor system in a room in their home or condo would no longer live without it. Often installed with ceramic tiles, this type of heating system is comfortable for the feet and offers an electricity saving. But what about the propagation of impact noise for those who live in the units below? The solution is to soundproof the heating floor system with an acoustic membrane or a floor underlayment specially designed to provide peace of mind to the occupants. Impact noises are caused by an object that comes into direct contact with the flooring: an object falling to the ground, a person walking with high heels, running children, etc. With an electric heating floor system, the heating cables are often installed on a concrete slab or a concrete topping. As the concrete is cold, the heating cables lose some of their effectiveness in trying to heat the concrete slab or the concrete topping. 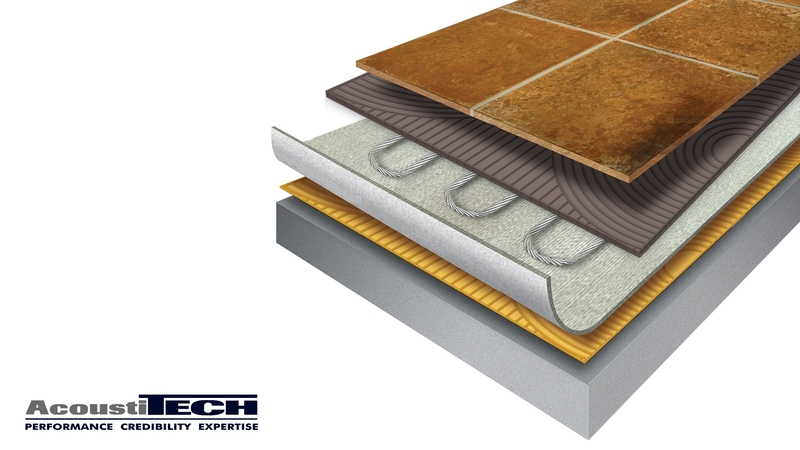 The installation of a subfloor underlayment (or acoustic membrane) blocks the cold from the concrete slab, reflects heat directly to the flooring and reduces the vibration. Therefore, it increases the performance of heating floor systems and reduces impact noises. Several methods of installation are possible, refer to our installation guide.